On my trip thus far I have had the opportunity to visit quite a few biodynamic growers and producers, from California to Casablanca. With 15% of all vineyards (anecdotal) engaged in biodynamic viticulture in Alsace, this may be considered the unofficial home of it. As an atheist and natural cynic, my initial impression of the biodynamic principles outlined by Rudolf Steiner almost 100 years ago was that it sat somewhere between a cult and a pagan rite. Even after studying the principles through my Masters degree I understood the reasons for doing it, but didn’t necessarily understand the philosophies and some of the practices involved. Perhaps it is also my business and marketing background that makes me a little more cynical about it and it may be a different case if I were an agriculturalist myself. In my trip I have learnt a lot about the concept and met many passionate and committed individuals, but I have also met as many cynics. At the end of the day, if it makes better wine, that is all I care about. I certainly don’t ascribe to gaining certification merely as a marketing strategy, and respect people who truly believe in it to produce healthier soils and vines. 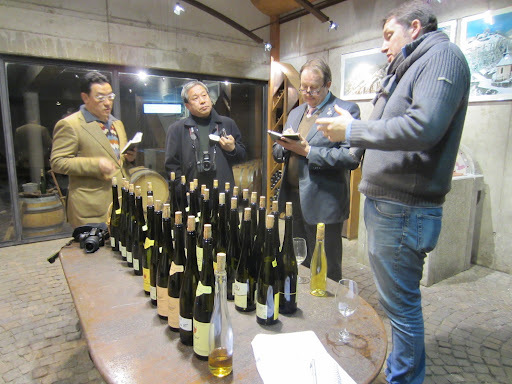 My week in Alsace saw me visit many of the top producers using the philosophy, and all three of my visits on the third day were BD producers. 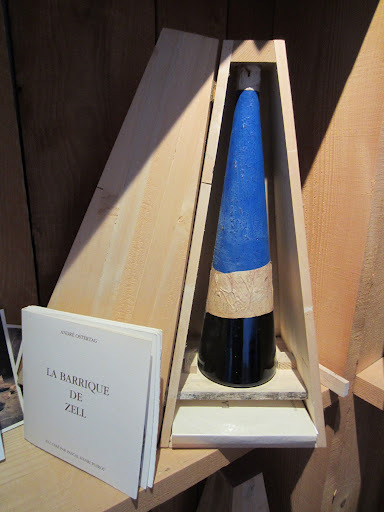 Domaine Zind-Humbrecht is one of the most famous producers both in the region and out of it for a number of reasons. The first is they are one of the best known proponents and promoters of biodynamic viticulture. The second is that Olivier Humbrecht is not only an exceptional winemaker, but he is also the President of the Alsace Grand Cru Organisation. The third reason is that they produce wines from some of the finest vineyards in the region. The families date back to 1620, but the estate was created quite recently in 1959 through the marriage of Zenon Humbrecht and Emile Zind. I was both fortunate and unfortunate to be joining a group of very important visitors to the winery. It was fortunate because I was able to taste wines I could only have dreamed of had I visited alone. It was unfortunate because the Japanese visitors did not speak English, but did speak French, and as such I missed out on a lot of the information. This made me feel like a bit of a fifth wheel and an amateur, especially as these gentlemen were far more experienced than I. It also meant I didn’t really learn very much, which was a shame. I would love to have had the opportunity to discuss a great many things with Olivier, as the opportunity is rare. Click here to read about the highlights from the tasting. Feeling a little weary from the huge tasting that lasted three hours, I drove to the north of Alsace to visit Domaine Marc Kreydenweiss in the very picturesque village of Andlau. 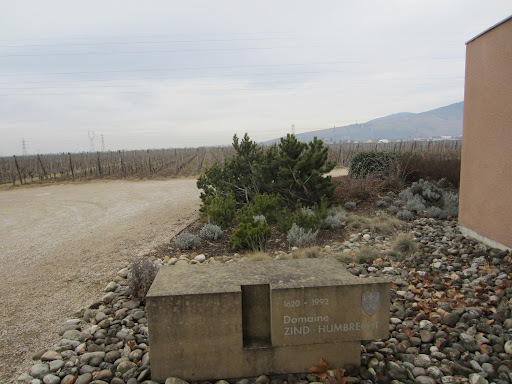 Due to a miscommunication I visited 24 hours late when the winemaker Antoine Kreydenweiss was not in, but I was still able to taste the wines and find out a little about the winery. It is a relatively small production and the winery exports most of it. The focus of the wines is obviously on expressing the terroir, and it is done in a number of ways. The first is by using biodynamic principles in the vineyards to allow the natural environmental harmony to express itself through the vines. The second is by respectful winemaking, which starts from when the fruit is harvested all the way up to when it is bottled. Across the range there is a standard label for all the single vineyard and blended wines, and each vintage there is a new design commissioned by an artist. As you can see below there is great variety in the designs. The wines are naturally designed to be aged, but they exhibit elegance and balance in their youth that they can be enjoyed young. 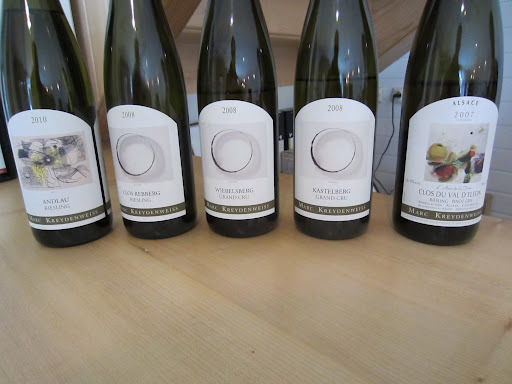 Looking at three rieslings from the 2008 vintage, two of which are classified Grand Cru vineyards, was a good opportunity to see the subtleties between sites not very far away from each other. Click here to read my notes on the tasting. Very close to Kreydenweiss both geographically and in terms of friendship is Domaine Ostertag, in the village of Epfig. A relative new player on the Alsace scene, Andre Ostertag has gained a cult following not only for the quality of the wines they produced in limited quantities, but also the distinctive branding the winery uses as designed by his artist wife, a professional artist. Once again biodynamic principles determine the viticultural philosophies, but purely to produce better fruit with which to make better wine. Andre was a pioneer in the region in the use of oak barriques to ferment and mature his white wines, most notably his pinot gris’. At the time this was very unusual, as the norm was to partially or fully ferment whites in either stainless steel tanks or 5,000 litre foudres of over 20 years of age. Andre is a very pragmatic winemaker and businessman, whilst having an artistic temperament. He believes in the expression of terroir, but through grape variety. He also understands that to produce wine that will age in the bottle, and will also travel to markets around the world, the addition of sulphites is necessary. He does some crazy things, like special bottlings of very rare wines, in super crazy bottles too. I admire this kind of logical insanity. Click here to read my notes from the tasting. Click here to see more photos from Day Three in Alsace, France.